The MacBook Air's battery life is legendary. Colleagues who drive MacBook Airs claim they can get all-day battery life, and that no similarly sized PC can do the same. But now we have a real contender: The Dell XPS 13. Time to test those claims. Before we dig in, it's important to note that there's no single test that can compare PC and MacBook battery life directly. We have to arrive at comparable numbers through reasoned use of similar tests. I'll also be discussing other reviewers' tests to help paint a more detailed picture. Other outlets have actually expressed disappointment with the XPS 13's run time. Jason Evangelho of Forbes said: "Dell’s battery life claims miss the mark by a not-insignificant amount, and the XPS 13 still can’t match or exceed the Air in that department. I was desperately hoping it would. But is it poor battery life? Absolutely not." The XPS13 can out perform the MacBook Air in battery life even with its high resolution screen. Here's an important detail, though: Evangelho's comparison was with a MacBook Air 13, which has a larger battery than the MacBook Air 11. He's also planning to retest after disabling Windows Indexing and seeing the Dell's life shoot from 7.5 hours to 9.5 hours. Over at Gizmodo, Sean Hollister was also deeply disappointed: "Dell quotes up to 15 hours of battery life, and I struggled to get even half that in the real world." But he, too, tested the XPS 13 agains the MacBook Air 13. Hollister tested the QHD+ version and the 1080p version of the XPS 13, getting 5 hours and 6 hours respectively, while the MacBook Air 13 gave him 8.5 hours of practical use. The MacBook Air 11 is slightly smaller than the XPS13 and also has 1/5 its pixels too. Here's where my tests will differ. In my view, the MacBook Air 13 is quite a bit larger than XPS 13, despite the XPS 13's similarly sized panel.The fairer comparison to the XPS 13 2015 should be based on size. So I reached into our locker for a MacBook Air 11 2014. That model is just slightly smaller than the XPS 13. That's also where you'll see some pretty big differences in specs. While the CPU and storage options don't change, Apple takes advantage of the Air 13's larger chassis to pump up the battery capacity. The MacBook Air 11's battery is 38 watt hours. The MacBook Air 13's is a massive 54 watt hours. That's about a 40 percent increase in battery capacity over the MacBook Air 11, and a little better than the Dell XPS 13's 52-watt-hour battery. I'll also point out that both Dells pack far more pixels than the competition. The top-end XPS 13, with its QHD+ screen, has a resolution of 3200x1800. The base model's is 1920x1080. The MacBook Air 11 is 1366x768, while the 13-inch model is 1440x900. Thinking about resolution in megapixels helps illustrate the scale of the difference. 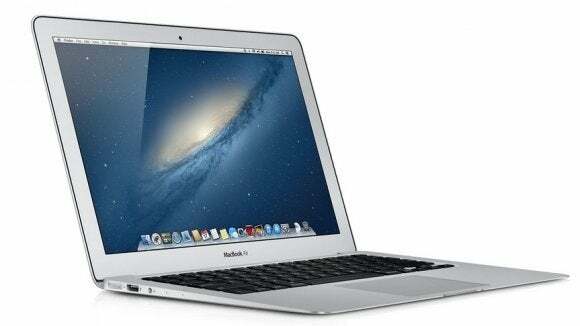 The 11-inch MacBook Air is 1MP (1 million pixels). The 13-inch model is 1.3MP, and the 1080p XPS 13 is 2MP. The high-res Dell XPS 13 is...wait for it: 5.7MP. As we all know, an increase in resolution can impact battery life. We've seen it in phones and laptops. Pixel density is nice, but it isn't free. I queried Dell's laptop panel expert, who summarized it this way: The circuitry to drive the panel eats more power. A 1080p panel might consume 0.9 watts, while a 4K panel controller might use 1.3 watts to 1.5 watts. That's significant when you consider that the monitor generally consumes the most power on a laptop today. Then there's also the power needed to light higher-dpi panels. Because the pixel pitch is much tighter, it blocks more light. That means it takes more light to get to the same brightness level of a lower-resolution screen. One way to get around that is to use different screen technology. IGZO panels, for example, let more light through than a traditional high-res IPS panel, so you don't have to burn as much power to hit the same lighting levels. It's a trick Lenovo/NEC is taking with its LaVie to cut the weight to 1.76 lbs. By using an IGZO panel, Lenovo can reduce the battery size while maintaining acceptable brightness and run time. In my XPS 13 review, I used BAPCo's MobileMark 2014 test. It's the updated version of the industry-standard MobileMark 2012. It uses off-the-shelf and popular applications, and it runs them through various tasks at normal speeds. MobileMark is unlike most rundown tests in that it acknowledges typical users' tendencies to take breaks or zone out like Office Space's Peter Gibbons. MobileMark replicates this by allowing long pauses and letting the screen go to black. 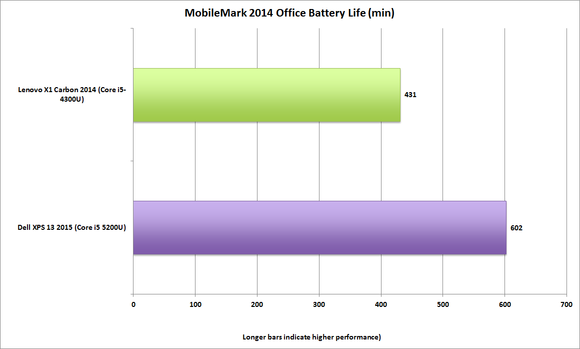 The above test shows the battery life performance of the XPS 13 with QHD+ screen against the larger and older Lenovo X1 Carbon 2014. Despite its higher-resolution screen, that's decent battery life in the Dell. The X1 Carbon is a different beast: It has a 14-inch screen and a 45-watt-hour battery. Keep in mind, that's with the Wi-Fi hot (but connected to a router that goes nowhere), which is required by MobileMark 2014. The XPS13 on top of the MacBook Air 13 shows the size difference and why I selected the MacBook Air 11 for my tests. There is no MobileMark on the Mac that runs in OS X. Yes, I could install Windows 8.1 and dual-boot, but I'm not sure that accomplishes much. I'm also not sure how much actual optimization Apple does for Windows. I suspect the company would rather have its users boot into OS X and run Windows apps in Parallels. Is there really a cross-platform battery test that makes sense? I'm investigating, but for now I decided to do video run-down test. It's something everyone can agree is a fair usage scenario. For what it's worth, Apple rates the 11-inch MacBook Air for 9 hours of browsing and 8 hours of video runtime. The 13-inch model, with the 40 percent larger battery, gets you to 12 hours of browsing, 12 hours of movies. Dell rates the QHD+ version of the XPS 13 for 11 hours of browsing and 8 hours of HD video playback. The 1080p version of the XPS 13 takes it to 15 hours of browsing and just under 13 hours of video. Each company uses its own battery methodology that can't be directly compared. Even the "browsing" tasks are different: Apple uses iTunes to play a 720p video, while Dell uses Microsoft's standardized Windows Assessment & Deployment Kit, which uses an H.264 file to gauge battery life in Windows-based devices. With two different video files and two different video players, it's like comparing oranges and bricks. 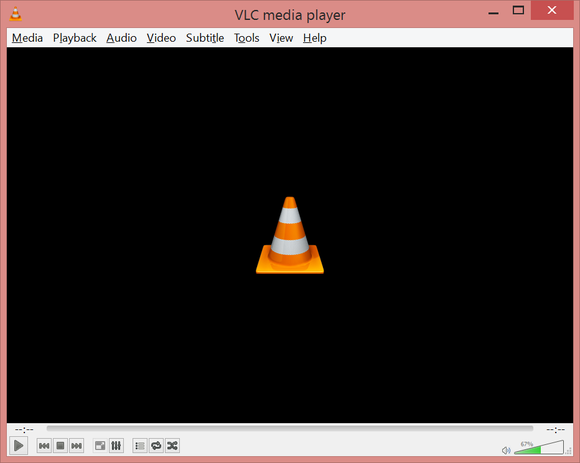 VLC is popular because it'll play just about any file format in the universe and it runs on OS X and Windows. 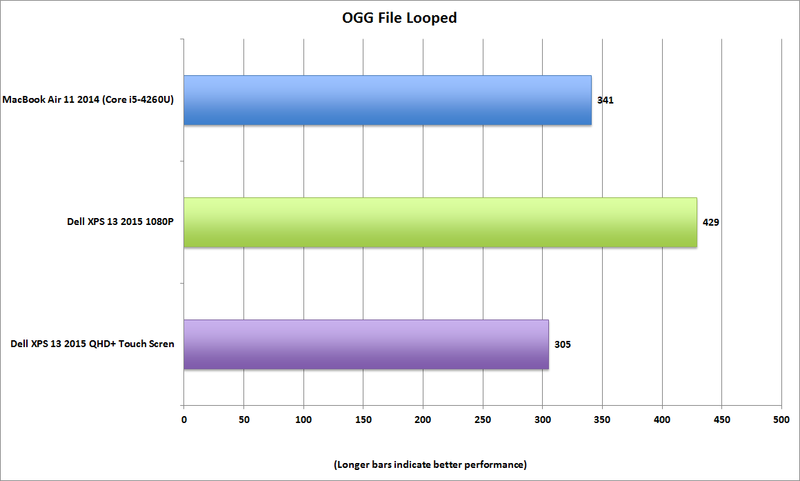 To make it as even as possible, so I grabbed VLC 2.1.5 for OS X and Windows and used the 1080p Big Buck Bunny .OGG file PCWorld has. You should know that using VLC on Windows hardly favors the platform—in fact, it's downright mediocre in optimization. Tim Schiesser over at TechSpot has done some great testing on this front, and other individuals have validated his findings. For my tests, I disabled hardware acceleration in VLC on both platforms, as I saw screen corruption when I enabled it under OS X.
I disabled variable screen brightness on both platforms and set the brightness to as close to 190 nits as I could on all three laptops. The QHD+ was actually putting out closer to 200 nits. I used our Minolta Photometer to measure the laptops' display brightness at dead center. If you're setting the laptops based on the percentage of slider controls, you should know that doesn't mean much. Setting the the MacBook Air 11 to 50-percent brightness is about 64 nits, while the same middle of the slider setting on the XPS 13 QHD+ is 185 nits. That's a huge difference. So as not to annoy my officemates, I ran our tests with volume muted, which isn't realistic, but at least the audio was not a factor. Since I wrote my original review, I also was able to obtain the 1080p version of the XPS 13 that has 4GB of DDR3L/1600. My results are in minutes and were manually recorded by having all three laptops sitting on my desk and noting the time when the screens finally went to black. WiFi was hot on all three, but the connected router went nowhere, so there was no chance of their downloading updates in the background. Using VLC and the 1080p .ogg file, I saw about five hours on the QHD+ XPS 13, another half-hour so on the MacBook Air 11, and just over seven hours on the 1080p version of the XPS 13. It's pretty clear that with a lower-resolution file and using Windows 8.1's built-in Metro video player, the XPS units can come close to the rated video run time. There should also be a healthy bump up in run time for the MacBook Air using iTunes. So the MacBook Air 11 is better in run time, right? Sometimes. 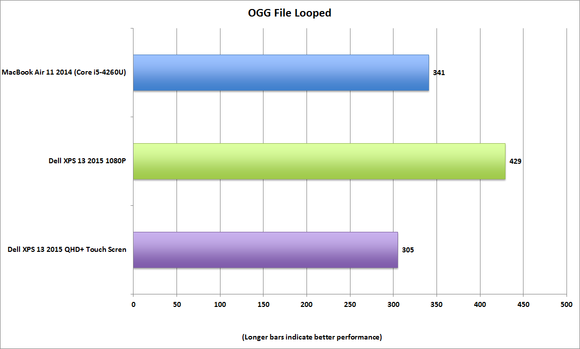 When I ran my original review, I actually didn't use the shorter .ogg file. 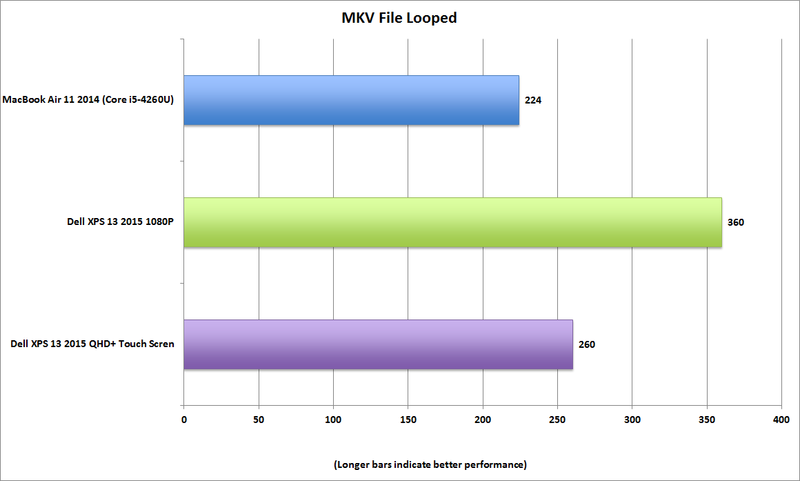 I used our encoding test file: a 31GB MKV file that's high bit-rate and 1080p. 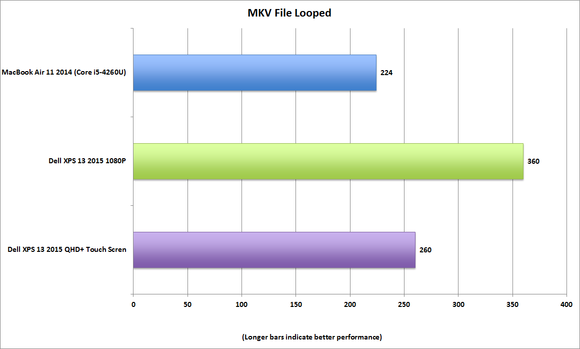 Using a higher bit rate MKV file, the MacBook Air 11 loses to both XPS13 units. That file is a bear, and we can see all the laptops taking a far bigger hit in battery life--including the MacBook Air 11, which suddenly falls behind the XPS 13 QHD+. This could be because the Haswell CPU in the MacBook Air 11 worked harder to decode the file than the Broadwell CPU in the XPS 13, or possibly something to do with the M.2 drive in the MacBook Air, which is PCIe-based and far faster than the M.2 SATA in the Dells. I also believe that unless you're saying what exactly you're testing and how you're testing it, it's not very easy to compare the two platforms on pure battery life. I also don't think it's valid to try to compare platform Y against platform X by seat-of-the-pants testing of "using it." That's just too hard to replicate in a manner that's actually useful beyond trolling each other in a forum. Maybe the best way to settle this discussion next time is to say your mileage may vary.